When I originally thought of posting a recipe for split pea and ham soup, I knew it was going to be problematic. Like dhal, pea and ham soup is not pretty, but worse, it’s not textured like dhal. In reality it’s one of the ugliest meals you’ll ever eat. I remember when my mum used to make it, she’d throw chunks of red kransky sausage in and it was like digging for treasure. It distracted us from noticing how this tasty soup looks in fact, like grey slop. 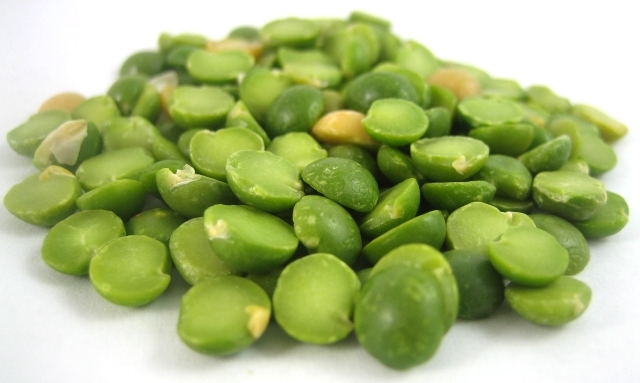 So instead of showing you photos of this unattractive soup, I thought I’d post a nice image of split peas and tell you a little bit about why this soup is a souper star. Split peas come in yellow and green and are the dried, peeled seed from the mature pod. Gregor Mendel, when developing his theory on genetics, used the pea for many of his experiments, discovering that the yellow pea is in fact dominant over the recessive green variety. So take the pea out of pod, peel its outer layer and there you have the split pea. Also called matar ki daal in northern India, the split pea is often used in dhals all over the world. Perhaps you’ve heard of the old nursery song about nine day old pease porridge, well then, pease porridge or pudding is in fact split pea and ham soup. Its tendency to get very thick is why it would have been called porridge as opposed to soup. Eating super fresh baby peas is a fairly modern culinary concept. And finally, if you need any more convincing that this humble legume is a star, then consider that split peas are great for your health, particularly those with diabetes, heart conditions, cholesterol or digestive conditions like IBS and diverticulitis. A single cup of cooked dried peas in your daily diet provides 65.1% of the recommended daily fibre and they help to stabilise blood sugar levels. They also provide lots of protein, two B-vitamins and important minerals along with a good dose of isoflavones, which help to reduce the risk of breast and prostate cancer. Split peas are also like a magical companion for cured meats because they contain a mineral called molybdenum that counters the effects of sulphites, which are present in most foods from the deli. I’ll end my split pea serenade by saying that fun facts and aesthetics aside, this soup tastes really good and fills you up on a cold day. Typically, this recipe would contain potatoes, but I leave them out to reduce the starch, calories and keep this meal super low GI. Throw everything into a large pot with enough water so that the ham is swimming about. Bring to a boil. Reduce to a simmer and cook until the peas are disintegrating, and the carrots are well cooked. Strain the soup through a colander to catch all the onion, leaves and peppercorns etc. Cut the ham and carrot into pieces and throw them back into the soup.